The hate mail is really piling up now. Apparently the teeming millions of readers out there are a little tired of the recent focus on bird posts over the last couple of months. You can’t say I didn’t warn you they were coming and if there was any way I could circumvent the birding rules (link here), trust me, I would. But rules are rules and without them… well you would have what I affectionately refer to as a mime school zombie attack – SHUDDER. This will not appease the author of “STOP POSTING BIRDS. I’m absolutely sick of it. I sit down at my computer, place my drink up on the stand, nestle into my comfy den chair and start to tickle the keys in eager anticipation of something new and exciting on the blog. BUT NOOOOOOoooo, all I get is another damn bird!” Or the most hurtful email of all “I’d rather listen to Hillary stumble through another woe is poor me stump calamity in her best I’m a robot impersonation than have to look at ANOTHER old bat … I mean bird”. Harsh. At least they didn’t threaten to vote for her if I didn’t cease feature birds here…. and because of that I can safely bring out another bird post. Seriously, this is all my brother’s (aka Mr. Competitive) fault.. blame him, I’m just trying to stay up with him on the counts. That would be a bird count that just had another increment thanks to today’s feathered friend. Normally I refer to the entire family as Just Another Sparrow or JASs because it is so damn hard to identify these birds. Every once in a while I shoot a variety that has some unique enough feature that I can pick it out in the reference guides. Previous to this post I was able to identify the White-Crowned variety (link here). Adding to that a House and a Chipping (link here). That was probably a good 4 hours of research I’ll never get back. As luck would have it, Ron and I were able to shoot another uniquely featured Sparrow while birding at Allerton Park in Monticello IL. 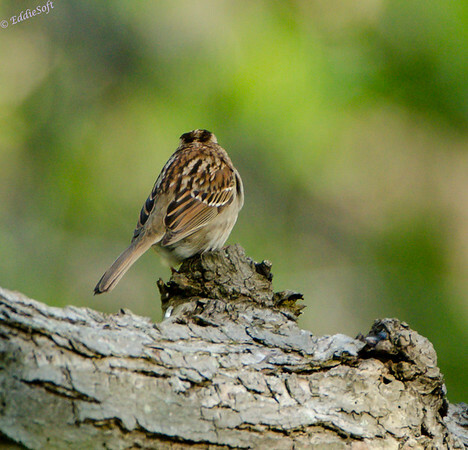 We actually came upon this Sparrow variety in multiple places in the park. First sighting was way out on the outer rim trail that follows the Sangamon Creek. It was sitting on a log and not exactly looking pleased we were intruding on its private retreat in the forest (you can see how pissed he was in the shot below). We also stumbled on one at the very end of that trail as we were climbing up the hill to the Sun God. There was a little better light at this sighting, but more branches to deal with. It is really easy to tell from that set of shots (above) that the unique feature I was referring to was the bright yellow spots at the base of the bill coupled with the brilliant white eyebrow and neck patch. 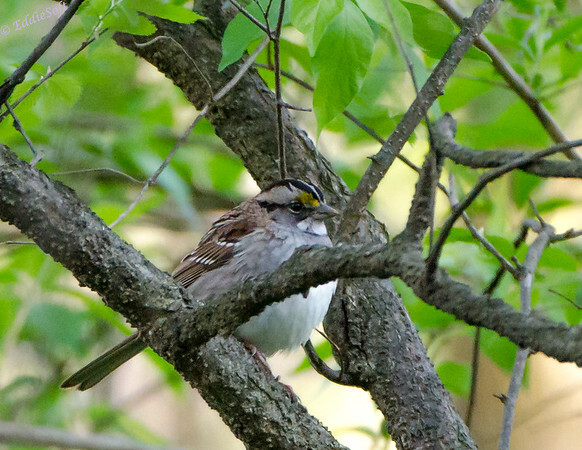 It didn’t take long to figure out this was a White-Throated Sparrow. Let’s all take a minute to celebrate the fact that we were able to identify a JAS! I’m telling you, that bird looks pissed! Maybe some interesting bird facts can ease the tension. Let’s see what Cornell has to offer. It appears our White-Throater may like the strange in the form of some Dark-Eyed Juncos. They’ll mate from time to time and produce a hybrid form. Now for this next one I’m just going to simply quote Cornell because quite frankly it’s too complicated to try and decipher much less summarize. 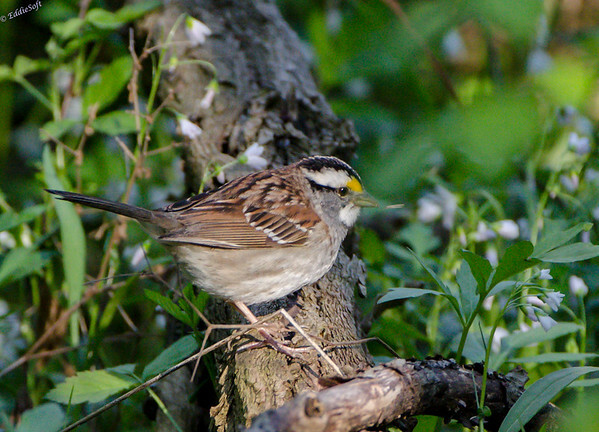 “The White-throated Sparrow comes in two color forms: white-crowned and tan-crowned. The two forms are genetically determined, and they persist because individuals almost always mate with a bird of the opposite morph. Males of both color types prefer females with white stripes, but both kinds of females prefer tan-striped males. White-striped birds are more aggressive than tan-striped ones, and white-striped females may be able to outcompete their tan-striped sisters for tan-striped males.” [cited from Cornell’s website – link here]. If you understood that after just one or two reads you have earned my birding respect. They are primarily ground nesters and apparently have a serious dislike for the Western states (except for a band up Highway 1 along the California coastline – it is quite scenic so I can’t blame them). Yep, just another Sparrow from this perspective. Not much else really to cover regarding this particular bird. All that is left is to put that mark of satisfaction in the Birding Life List – yeah! You all come back real soon ya’ all! This is a pretty bird, and it seemed pretty large when we were photographing it. I have no idea what that Cornell quote is trying to say, nor how that necessarily leads to persisting the two forms–how strange. I may try to represent that in a generational chart, because how that happens when the birds always mate with the OPPOSITE morph is beyond me! I now have an app (Heads-Up Sparrows) that shows just the heads of all the sparrows, and you can compare the full-body pictures of any of them, so maybe we can tell these sparrows apart easier. Mr. Competitive?? Not me, I just sort of drift around and if I see a bird, *yawn*, I may see about taking a picture or two if I’m not too distracted. 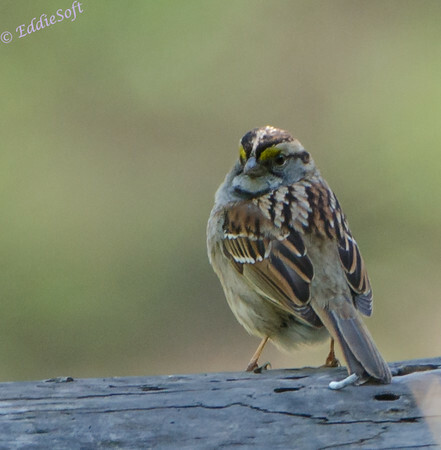 Thanks for the pictures of this cool sparrow! Cool, I can leverage that app on a ton of pictures that have just been sitting in my queue waiting and waiting and waiting for some method to identify them! This was a larger sized bird .. at least the specimens we were photographing. And for the record, MR COMPETITIVE is probably an understatement – especially someone willing to do a crown challenge in Trivia Crack with a 5-2 lead sigh! Previous Previous post: A Pair You What?